Allie was born on April 30, 2008. She was full term and delivered by C-section. She was 5lb 8oz and 16.5 inches long. She had no health concerns when she was born. After Allie was home for several weeks, I realized that she wasn't taking much milk. I stopped giving her breast milk and tried other formulas. As the months went on, Allie was taking less and less formula. At 6 months old we started baby food and Allie would never eat more than 1/4 of a jar. Our Pediatrician referred us to the Children's Hospital of Wisconsin (CHW). Dr. Rudolph and his team ran an array of tests and couldn't figure anything out. Allie was deteriorating before our eyes. She had major muscle loss and having lots of neurological effects. She had been saying mama and dada but at this point (1.5 years old) she had stopped talking completely. We did a one week outpatient feeding intervention at the CHW but it didn't help her at all. She has been on a couple appetite enhancer medications but they only seem to have an effect for a very short time and then Allie goes back to not eating. Allie has every capability to eat and she does eat very small amounts. She just cannot/ will not eat enough to gain or even maintain her weight. In December 2009, we had a follow-up appointment at the CHW. I requested Allie receive a feeding tube because she was not developing correctly and basically wasting away in front of us. Allie was 1.5 years old and the size of a 6 month old. 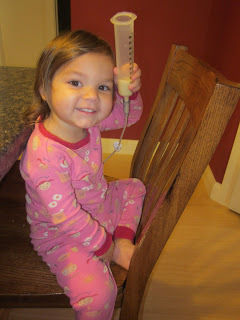 She had her peg tube put in on December 9, 2009. She had many complications and severe vomiting for 2 weeks so Dr. Rudolph put in a G-J tube. Allie had the G-J tube for months and continued to vomit occasionally. Her J-tube was removed in March so she is fed only through the G-tube now. 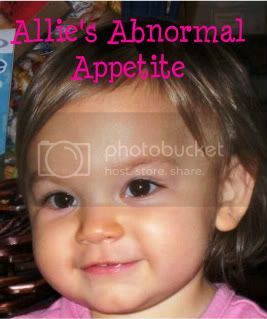 Since CHW was not able to give us a diagnosis for Allie, we took her to Mayo clinic in May 2010. They were also stumped and were not able to diagnose Allie with anything. They suggested that Allie has a neurological disorder and it will probably never get diagnosed. The doctors have tested Allie for everything, she even had extensive genetic testing. Everything comes up fine. They are trying to focus on her stomach function because her latest gastric emptying test (for liquids) showed a slight delay. Allie has a lot of problems with vomiting and has been on Peptamen Jr. milk (partially digested milk) for the past 4 months. Up until last month, Allie was receiving 4 bolus feeds throughout the day and then continuous feeds with her night time pump. We weaned her off the pump but quickly realized that Allie could not handle all of her required calories with bolus feeds. Allie is now fed 4 times a day with her pump and she carries a backpack. Allie does not like carrying her backpack around so it's been a struggle getting her used to her new feeding schedule. We are starting this blog late in the game but we have been blogging on Allie's caringbridge site - here is the link: http://www.caringbridge.org/visit/allieberndt Allie's caringbridge site shows what she has been up to the past 2 years!! Since we have not been able to get Allie a diagnosis, we will continue to go meet new doctors to see if they can help us. I am determined to get help for Allie and one day get her tube free. 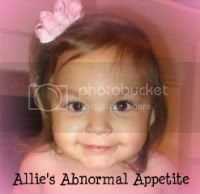 We welcome all comments or suggestions and if you have a child like Allie, please feel free to contact me!! !